Ian McKellan is exceptional in a King Lear that’s all about Lear. I think what’s astonishing about Ian McKellen as King Lear is the ease with which he embraces Lear’s language and tragedy. He acknowledges and accepts with a sort of serenity the underlying futility behind Lear’s pomposity, fury, madness, and love. His invocations to the heavens, gestured by a ritual hand signal in Jonathan Munby’s refined production, erupt with white heat and then burn off into the air alongside his waning voice as he stands there, slightly swaying. Mesmerizing to watch and enlightening as Lear, McKellen is also clearly comfortable. And that makes sense. 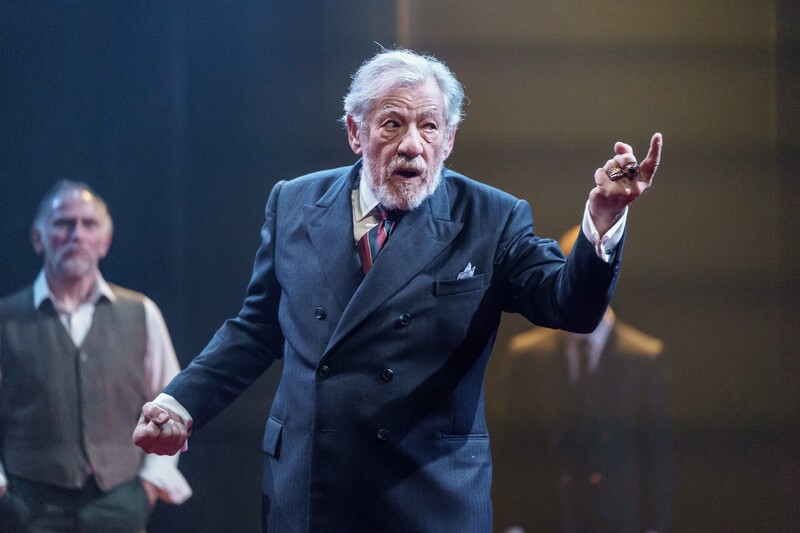 Not only is this the second time McKellen has played Lear (the first being in Trevor Nunn’s 2008 production), but he has already reprised the role for this production when it premiered in Chichester last year. Attempting to replicate the intimacy of its original Minerva theatre setting, designer Paul Willis has removed seats from the Duke of York’s and added a long centre aisle that leads onto a stage with a circular red carpet. It still feeds oddly alienating though, with tall oak-paneled walls looming behind and evoking a regal, imposing, and ancient quality to this temporally ambiguous Britain. The pomp and formality (along with a full anthem) that welcomes Lear slowly crumbles, with Anita-Joy Uwajeh’s banished Cordelia returning in contemporary army apparel with a French flag on her arm. Munby’s production doesn’t reimagine Lear in a different context nor does it pay particular attention to the external world beyond the family drama. Instead, it concentrates intensely on the characters themselves, casting them in new light as they move towards inevitable downfall. Zooming in on most of them with clarity and precision, Munby even includes an explanation for the disappearance of the Fool, expertly portrayed by Lloyd Hutchinson. When you have McKellen leading the charge, it’s a smart choice to hone in on character. But there are others who amaze too. Kirsty Bushell’s Regan is insanely good. A ditzy, gentle veneer hides a severe sadistic side, making Regan quite literally unbalanced, either springing about the stage or swaying with her legs crossed. And Danny Webb’s Gloucester is excellent, mixing his foolishness with the shock of a man who’s never had to recognize his own faults. But even with good performances, other characters fall slightly into shadow due to a lack of external stakes, particular towards the end. Sinéad Cusack’s Kent is like a present-day senior adviser to an increasingly senseless political leader. She’s strong and engaging, but Kent is left underdeveloped without an outside world to affirm her beliefs. And James Corrigan’s Edmund speaks in a breezy, charming rhythm, making him seductively likeable, but Edmund fizzles on impact as the end is rushed through. Still, this is a Lear about Lear, and it’s a strong production with an exceptional lead. McKellen leaves you bereft and exhausted, yet somehow and in someway, still enchanted. King Lear is on until 3 November at the Duke of York’s Theatre. Click here for more information.